Refighting the Pacific War: An Alternative History of World War II, edited by Jim Bresnahan, is an informed look at how World War II in the Pacific might have unfolded differently, giving historians, authors and veterans the opportunity to discuss what happened and what might have happened Contributors to this alternative history include noted military historians William Bartsch, John Burton, Donald Goldstein, John Lundstrom, Robert Mrazek, Jon Parshall, Douglas Smith, Peter Smith, Barrett Tillman, Anthony Tully, and H. P. Willmott; in all, more than thirty Pacific War experts will provide commentary, employing a roundtable panel discussion format. The reader will hear from the experts on how history could and could not have been altered during the course of the war in the Pacific. With multiple opinions, the reader will be provided with an interesting collection of divergent views about the outcome of the war. Refighting the Pacific War focuses largely on naval battles and campaigns, including Pearl Harbor, Coral Sea, Midway, Guadalcanal, Philippine Sea and Leyte Gulf. While the main concentration is on the major naval actions, the book also delves into key island battles, like Tarawa, Saipan, Iwo Jima, and Okinawa, as well as pre-war and post-war political issues. The panelists debate questions like whether the Japanese could have inflicted even greater damage on the U. S. Pacific Fleet at Pearl Harbor and how Yamamoto might have won at Midway and how such a victory might have impacted the direction of the war. The book extensively studies the opening year of the war when the Japanese war machine seemed unstoppable. 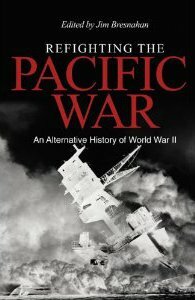 Also explored is whether the Pacific War was inevitable and whether the conflict could have ended without the use of the atomic bomb. Vice Admiral Yoji Koda, Japan Maritime Self Defense Force (Ret. ), provides the book's Introduction. Copyright © 2011 Jim Bresnahan. All rights reserved.